As the building currently stands. In a life almost three centuries long, you're going to cycle through a few different careers. So it is with the Van Ostrande-Radliff House -- AKA, Albany's oldest building -- which has served as a townhouse, a wax factory, and an equipment storage space (among other uses) over its 287-year-old lifetime. 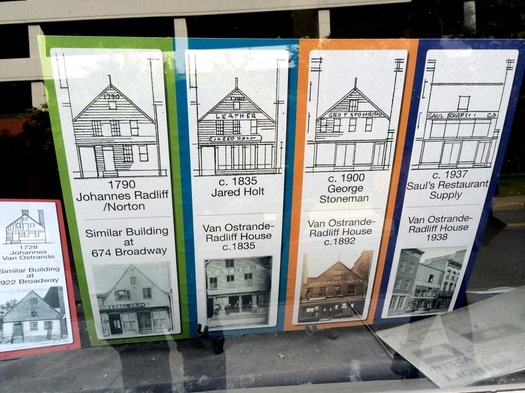 And now there's a plan for the Van Ostrande-Radliff House's next career: as a distillery. "It's a fun project for us," Historic Albany executive director Susan Holland said to us. "We're really excited." Holland said the idea for the partnership surfaced during a conversion with Capital Region REDC board member Omar Usmani about the possibility of scoring preservation money through the annual grant competition. (HAF is aiming to restore the front of the building to its original Dutch design.) As Holland explained, the preservation project would have to be linked to an economic development project, and she had heard that Albany Distilling was maybe looking to move from its current space just off Broadway on the north end of downtown. So she called up ADC founder John Curtin and the idea took off from there right away. Albany Distilling co-owner Rick Sicari said he and Curtin are excited about the idea of moving to the historic building -- especially Curtin, who's passionate about local history. And there's a practical side to the move, too. "We've really just outgrown the space," Sicari said of ADC's current spot. He pointed to the company's recent experience in adding an infusion still -- a key piece of equipment that, it turns, won't work in its current location because of space and plumbing constraints. He said they had been on the hunt for more space, visiting about 20 different candidates that, for a range of reasons, just weren't a good fit. So the possibility of moving to 48 Hudson Ave came along at the right time. Sicari said the move would allow ADC to expand its on-site retail offerings, provide more space for storage, and give them the room to host more visitors. "We would really love to add a museum-type atmosphere to it." "Even if it's two years from now, it will be worth the waiting," Sicari said. Said Holland of the project's total cost: "I think it's a pretty small investment in a building that's the oldest building in Albany. It's super rare, it's very unique to the United States. So we're really excited about it." Nice idea, but realistically this is no place for a distillery - or much else truth be told. The structure is unsound and will come with so many limitations that whatever Albany Distilling needs to construct will most likely be met with a thumbs down from the Planning Board's historical review among others. If you need space, go down to the warehouse district and use existing space. This location has been a white elephant for many years. I would hate to see a thriving business get into financial trouble trying to do a nice thing instead of the right thing. "The structure is unsound and will come with so many limitations" Evidence? I watched the efforts it took to stabilize it in 2009 when the state stepped in to attempt to preserve it. It's shored up, but it will take a lot of effort to support the structure AND preserve it's original heritage by using it for this purpose. See the RFP that the state put out for this area. "The privately owned House at 48 Hudson Avenue is listed on the National Register of Historic Places. Although the House is not included in the Site, due to its proximity to two of the parcels included in the Project, future construction activities will need to be undertaken in such a way as to avoid any damage to this property. In addition, there is a historic property located at 50 Hudson Avenue that is within the Site. Due to the historic status of this property, efforts to incorporate the buildingâ€™s historic elements or historic significance into the design of the Proposal are encouraged. Scale, setbacks, and context of new development should be respectful of both of these historic properties. The Designated Developer should expect that their Proposal will be reviewed in consultation with the New York State Office of Parks, Recreation & Historic Preservation (NYSOPRHP). Although the Site is well documented for its archeological sensitivity, Proposers should expect that the Designated Developer will be required to conduct subsurface investigations to determine whether there are any cultural resources that would be impacted and to implement the appropriate mitigation to protect these resources. Such investigation and mitigation measures would be developed in consultation with NYSOPRHP during the environmental review process following the conditional designation process of this RFP." This all translates to lots of $$$, time, and bureaucracy. Evidence enough? You are looking at an RFP for the area AROUND the building. Remember all the area bought up for the convention center project that was moved. That is what the RFP is for. Not this paritcular building itself. With HAF involved this project is miles ahead of a development RFP for area around this structure. The HAF is rightly obsessive about protecting these types of treasures and will make sure this project is done right. It's good evidence, but not convincing. Especially in an area where every single idea is dismissed as unworkable, regardless of what it is. They've renovated larger buildings in Troy that literally had no back wall or floors. My first thoughts were in line with ace's: Somehow this will result in ADC going out of business because of debt (or permanently moving to Schenectady because of never-ending delays). Being in a historic space would be great but as with all aspects of a business, there is a point where the costs are going to outweigh any possible benefit this building could bring. After the possible grant, there would still be 1.3 million in costs to ready the building? I'm sure that could buy a much more suitable space, ready to go, in the Warehouse District. Hi Ace, thank you for your comments but we have done our homework on the building and know what needs to be done here. The structure is not unsound. You are right that the building will need to retain its historic significance and architectural features, and that is exactly what will happen. Itâ€™s an important resource that needs to be saved and this is a modern approach to preservation. Itâ€™s an approach that perfectly suits the building and complements all of the investments that we know about that are happening now in Downtown Albany. In 2009, the building was privately owned by Orion Enterprises LLC. Historic Albany became the owner in June 2013. In relationship to the State, the only reference to 48 Hudson in the RFP that was released earlier this year is that developers in surrounding parcels must be aware of the historic resource that sits in the middle of a potential construction zone. Because it has historical significance, and it's a local landmark, any repair/restoration work goes before the City of Albanyâ€™s Historic Resource Commission. Archaeology has been done at the site before and any new construction and disruption of ground will be sufficiently investigated. We plan to lead by example in this preservation effort and look forward to bringing this building back to life by using best practices. You are right that $1.9 million and our two year time frame is a significant investment of money and time, but it is worth it to preserve Albanyâ€™s oldest building. If you have any specific questions about the project, feel free to contact us: info [at] historic-albany.org. Thank you for the insight, Historic Albany Foundation. Also, thank you for all the hard work you do to preserve our city and heritage. Well said HAF. 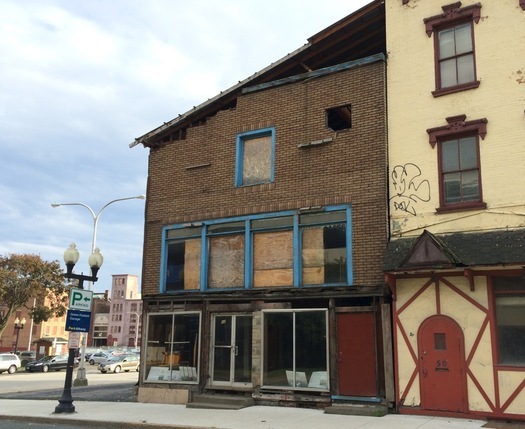 It is TIME for Albany and its citizens to start caring about its architectural heritage rather than simply looking for the easy way around challenges. This partnership with ADC is ideal...only small-scale, young ambitious entrepreneurs understand what is actually feasible, and they are what are so badly needed in this capital city. Don't forget the 20% Federal Investment Tax Credit Program and possibly the 20% State Tax Credit Program (if it's in an eligible census tract). Those could also help to offset the hefty price tag.